You can use this dresser to create a nice, peaceful environment with a simple yet lively décor. Why not look here for inspiration? create a fun and foodie ambience with dream in colour-themed wall decals. 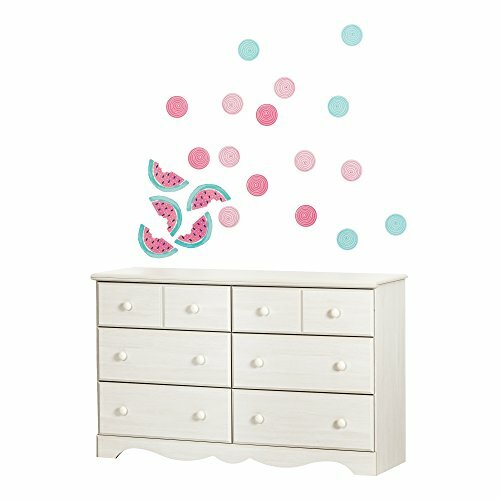 Soft colours and watermelon slices for a refreshing feel and a real touch of Originality in your child’s room. Includes a 6-drawer double dresser and 17 wall stickers. Features 6 practical drawers. Metal drawer slides. Stickers: 12, 75'' x 20''. stickers: vinyl. Meets or exceeds all North American safety standards. Requires complete assembly by 2 adults (tools not included). 19.5'' (L) x 52'' (d) x 31.25'' (h). box Dimensions: 65.669'' (L) x 20.512'' (W) x 5.787'' (h), 123 lb. Box #2 Dimensions: 3'' (L) x 3'' (d) x 30'' (h), 1.5 lb. Ships in 2 boxes, make sure to have a friend with you. Packaging tested and certified to reduce the risk of damage during shipment. Made in Canada. 5-Year quality guarantee on furniture, 30-day satisfaction guarantee on accessories. Any questions? Contact the manufacturer, available 7/7 by phone, email or chat.